I don't like it that I have a favorite, but this kitten is the coolest. Four kittens are a terrorist circus, rolling somersaults off each other, hanging upside from my pantleg, chasing their tails, then screaming in pain when they catch it, attacking for no reason, except being a six-week-old kitten. Now they each have a different personality, the most siamese-looking "Smokey" is very mellow and affectionate, the tabby one "the Rascal" is the first to do everything, open its eyes, eat real food, go outside, claw the furniture. He's super social, always the first one to come out and say hi, but more independent. The one with pink ears "Pinky" wants to be as crazy as the tabby one, the one with the black nose "Mignon" is the shyest, but doesn't want to be left out. Right now s/he has half a crayon in her/his mouth like a cigar and is spinning in circles. And she's the calm one. We have a home for one of them, maybe two. The kids have two weeks off school--lots of time to watch the kitten show. As soon as they go back to school we will foist the kittens off on some unsuspecting first-grader families. Or maybe I'll have a raffle. Here's how it works: if you don't buy a ticket, you win a kitten. 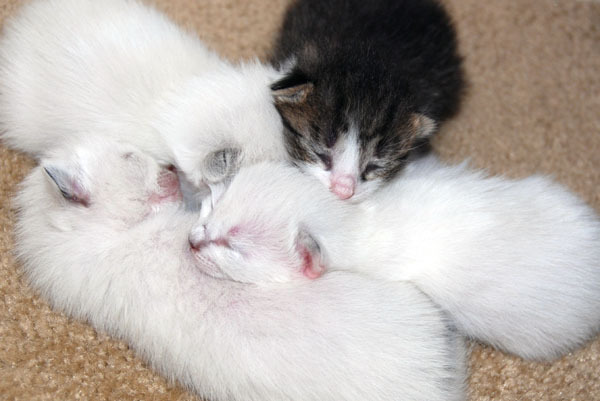 The kittens wandered out of Camille's bedroom for the first time, the mom saw and carried them all back in. It's hilarious when she carries them in their mouth. We are little worried about the mom, she is so skinny, and lizard is her preferred food. And we refuse to catch them for her. Didja think I'd make it whole week without a kitty cat post? They are one week old today. The white ones are starting to show faint markings, but look mouse-like and aren't really as cute as the tabby one, don't you think? 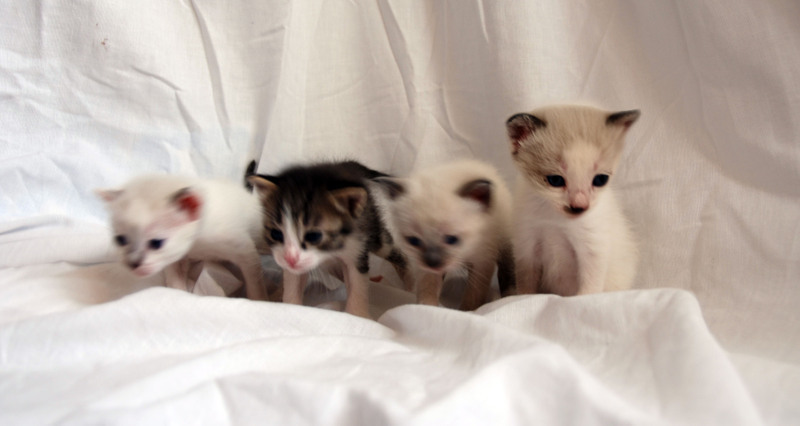 I'll think the white ones will get cuter. I hope. Or I'll never find anyone to adopt them. They haven't moved from this spot in about five days. 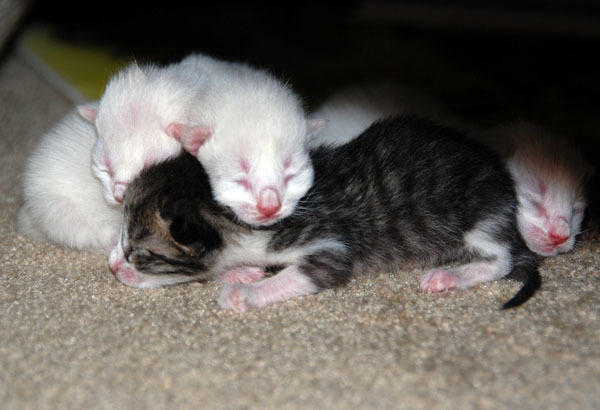 They can't really walk yet and they're eyes aren't open. So the first week, they just nurse and sleep, --as Craig Fergason says, remind you of anyone? 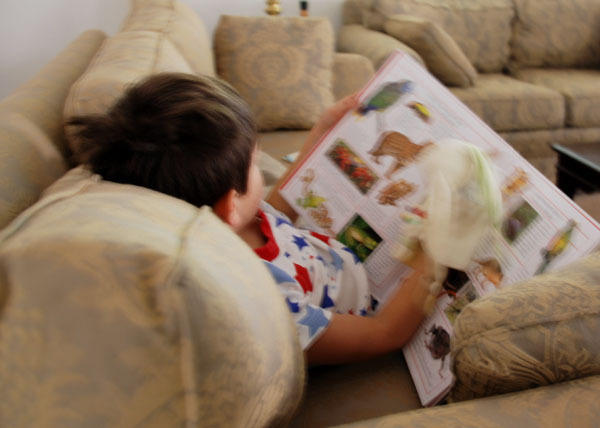 And Stefan reading one of his favorite books, an animal picture encyclopedia. The puppet is afraid of the snakes. 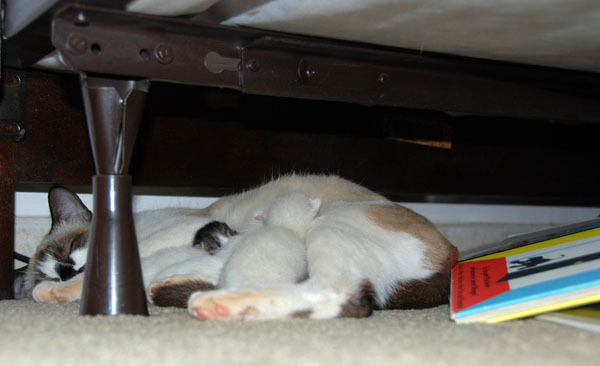 "The cat had her kittens!" Stefan came running into my room this morning, more excited than Christmas. She had them in the night under his bed. One, two, three, four. Three that look like her--yea!--and one funny striped one. Giselle is eating like a maniac and wants a lot attention herself. One of us sneaks in to check on them about every five minutes. "They're milking!" Stefan reports.